Hotel Rovinj is located on the sea below the Church of St. Euphemia in the heart of the historic old town. The site of an old military garrison because of its commanding views, the hotel was originally built in the 1960s with 80 rooms. Proficio acquired the hotel when it was in a state of disrepair, with only 16 rooms in operation. 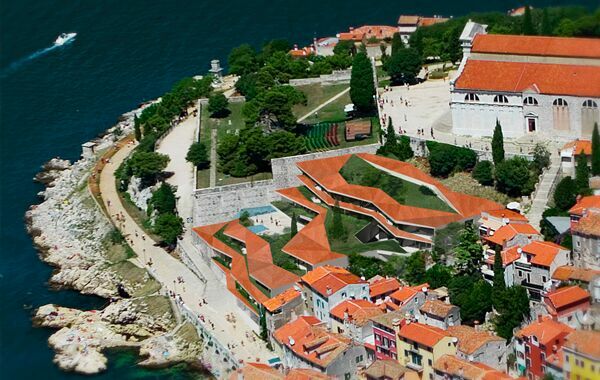 After the City of Rovinj’s public call for design of a new hotel resulted in 26 proposals, a jury of prominent professors of architecture, and conservationists chose the project submitted by the architectural firm Randic & Turato. Hotel Rovinj will be completely rebuilt into a luxury hotel with several restaurants and bars. It was only in 2015 that all the preconditions for the completion of the project were met. At present, the building permit is being obtained, and it is anticipated that new Hotel Rovinj will soon fit seamlessly into the existing Rovinj skyline, linking the traditional red roofs of its neighboring houses with the grassy spaces of the nearby Church grounds.